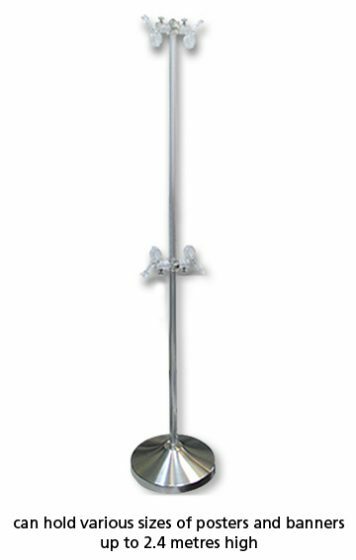 In this section, you can discover a vast selection of display stands to fit your every requirement. 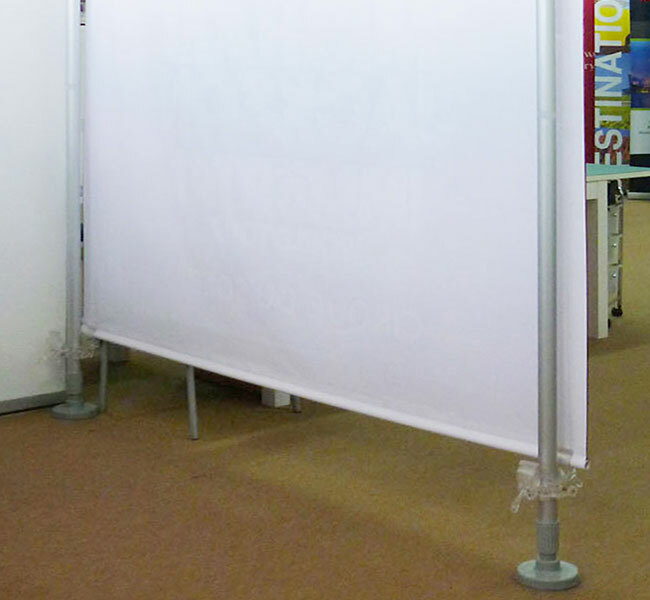 From clip stands to tripod easels to outdoor banner stands and queue poles, there’s a display stand to solve every display need you might have. 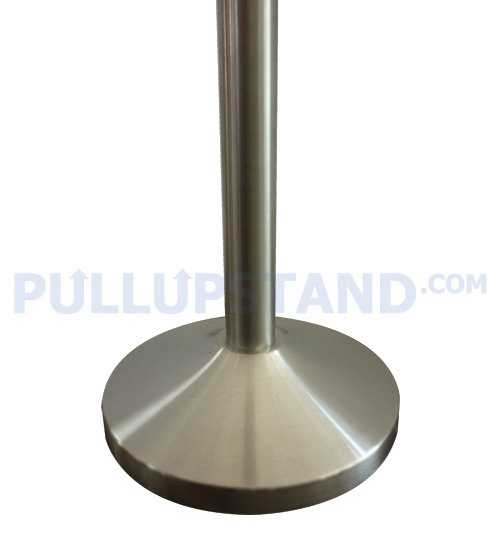 You might have different needs for the stand that you require – maybe you need it to be above a certain height so that the banner on your display stand is visible, or you might need it to be below a certain height to comply with regulations set by certain malls or stores, or maybe you need it to be very portable and easy to transport around, or even heavy enough to withstand heavy wind in outdoor areas. Different requirements will require different solutions. Talk to us if you are unsure. We will be most happy to note your requirements and suggest the right stand that will meet your needs. 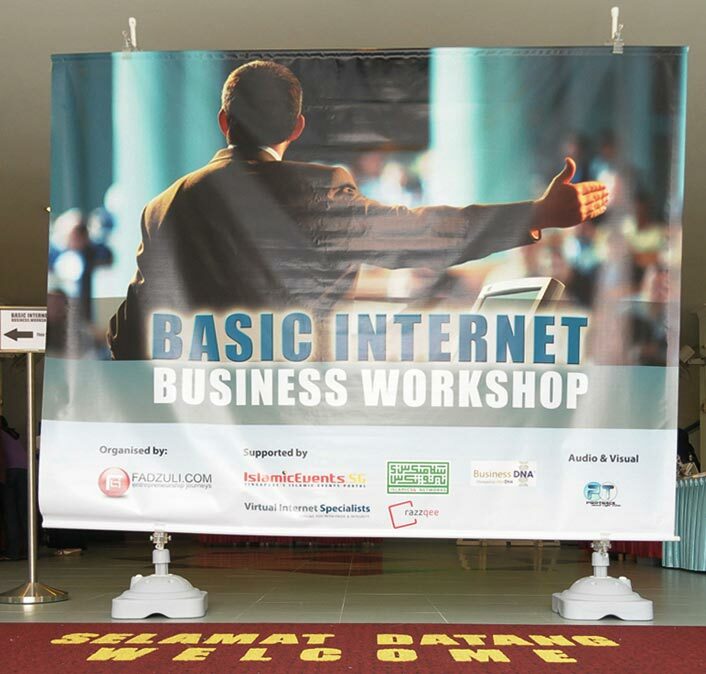 If you cannot find what you are looking for, drop us an email so we can assist you further. Thank you! Banners and posters are sold separately. 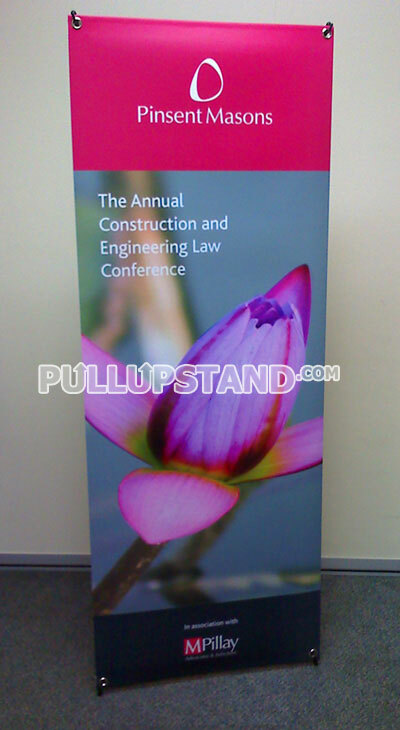 One of the sturdiest and most flexible banner stands available. 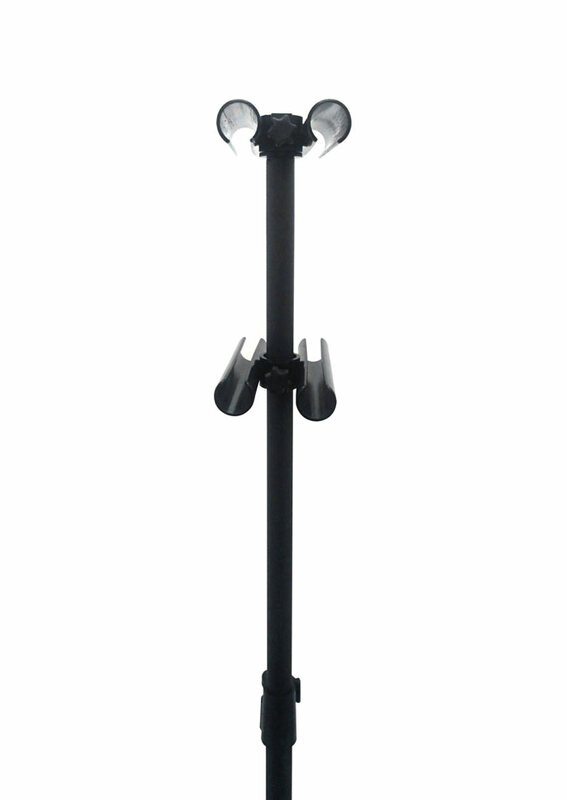 Its heavy base makes it a great display stand for outdoor use. Use it to hold up mounted posters or banners. 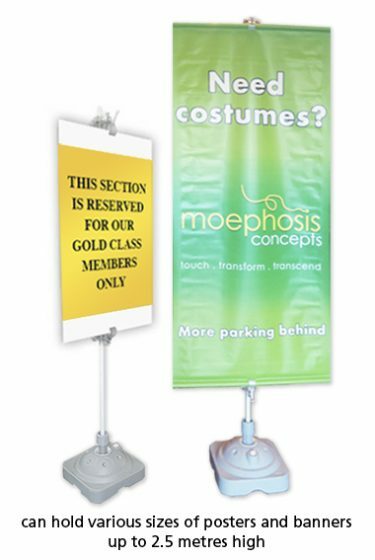 To hold large banners, you can use 2 or 3 of these clip banner stands to hold up the sides. 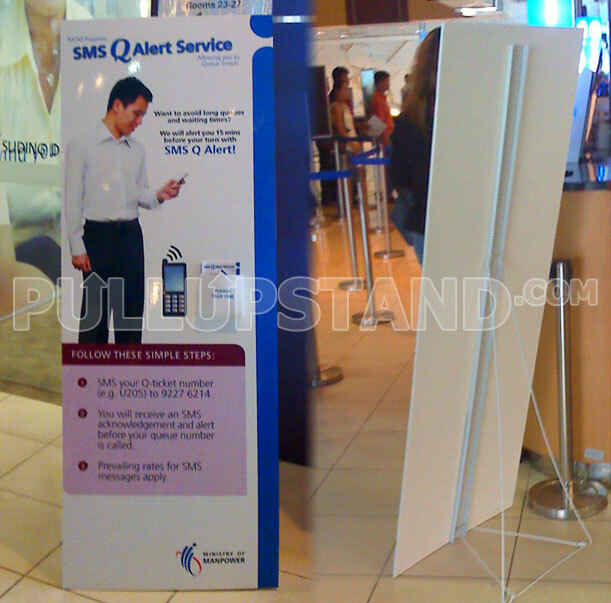 A very versatile and durable display stand. 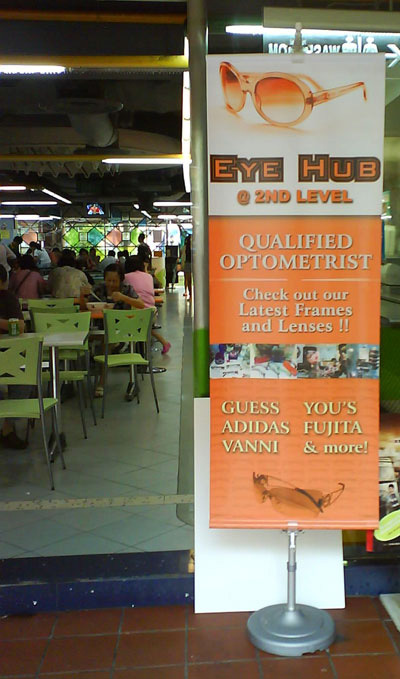 * Prices quoted for display stands in Singapore dollars. * Design services available, quote upon request. 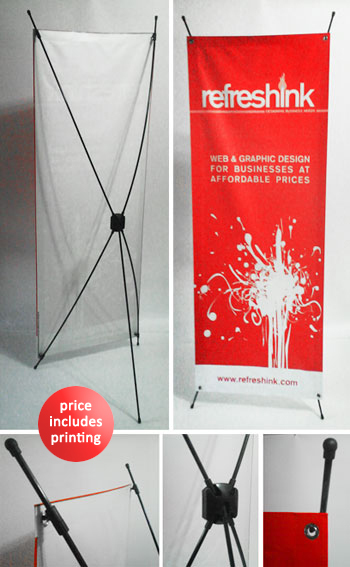 One of the sturdiest and most flexible banner stands available. Its heavy base makes it good for outdoor use. Use it to hold up mounted posters or banners. 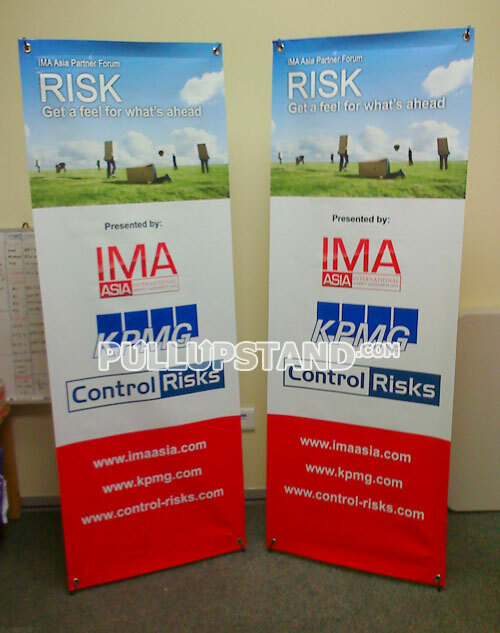 To hold large banners, you can use 2 or 3 of these stands to hold up the sides. A great looking and versatile display stand. 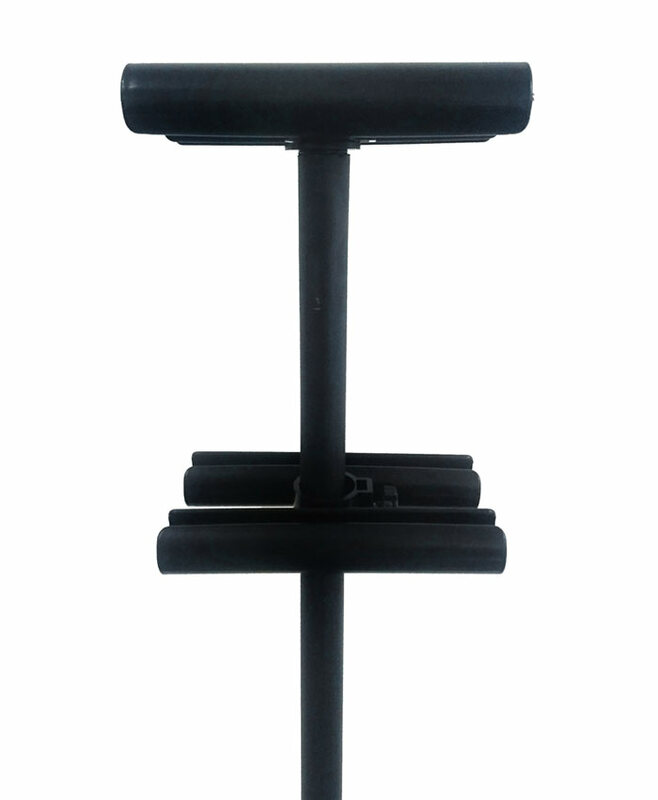 This clip stand model comes with a water base that fills up to make it 10.5kg heavy. 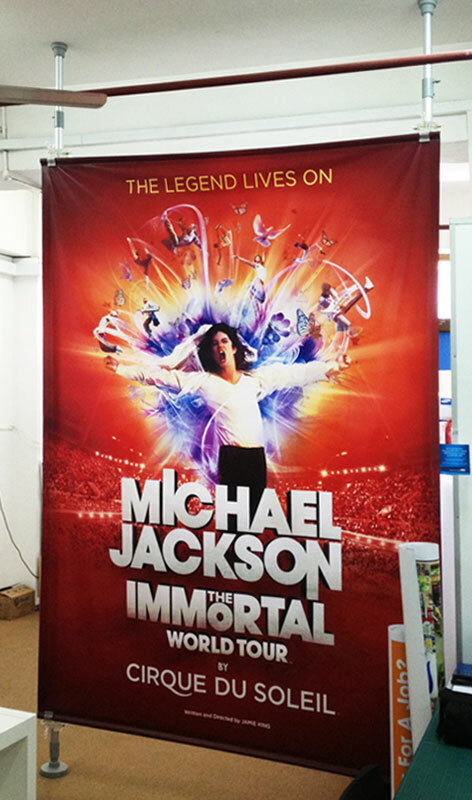 It can hold posters or banners of various sizes. 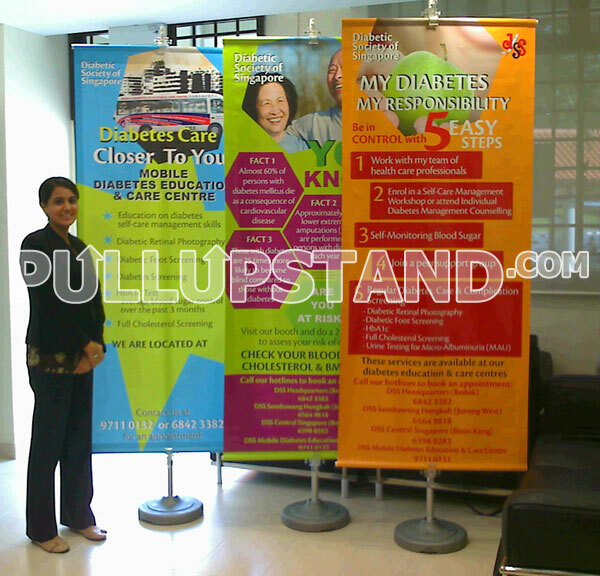 You can also use multiple stands to hold up a bigger backdrop banner. 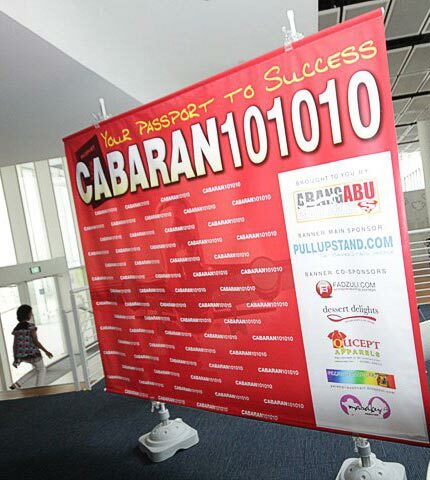 It is also easy to replace the banners with new designs for subsequent events. 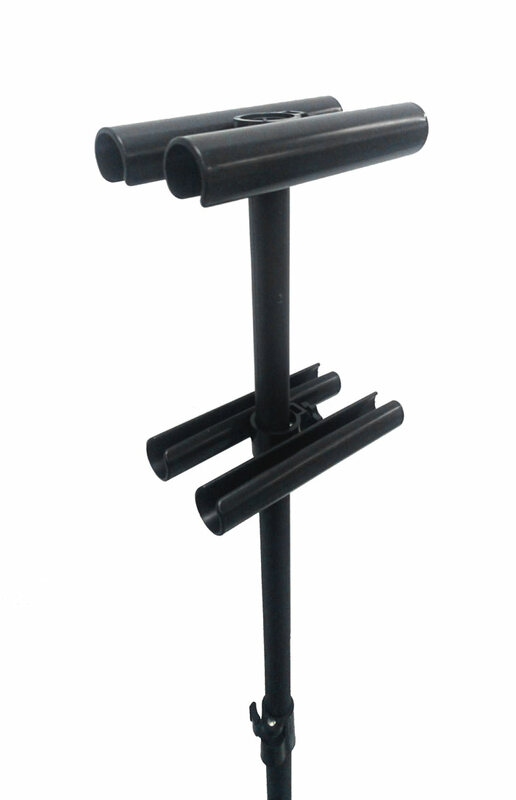 This display stand is great for outdoor events. 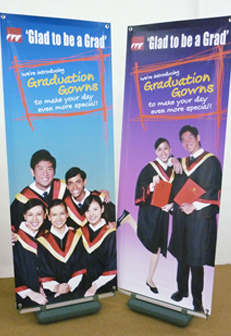 * We also provide mounted posters or banners for the banner stand. Posters and frames are sold separately. 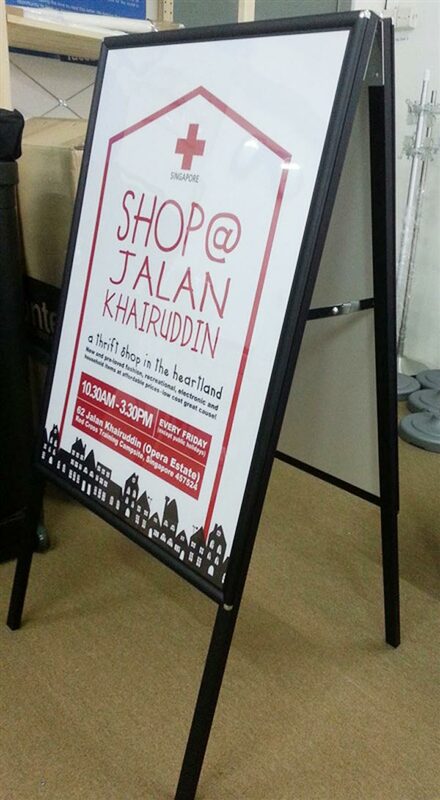 The frame stand is great for poster display at shopping malls and classy events. 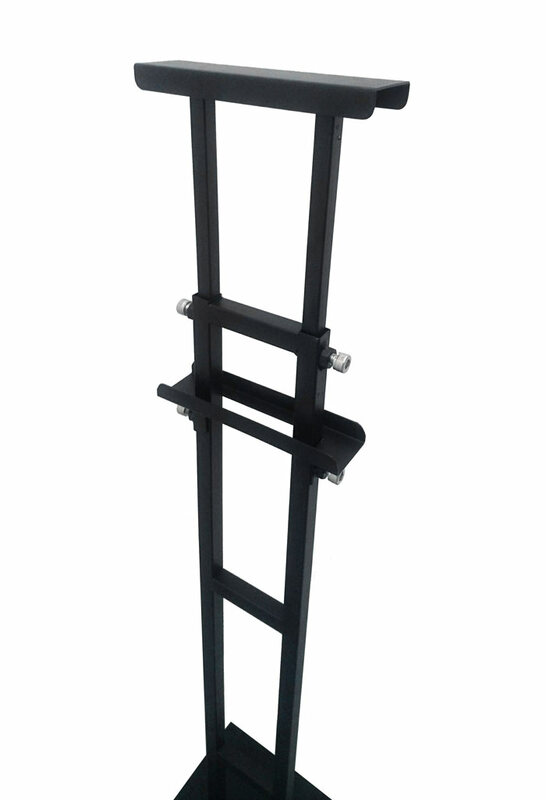 Its sleek matte black finish and classic straight lines makes it the popular stand of choice. A display stand favoured by those who love sleekness and sophistication. 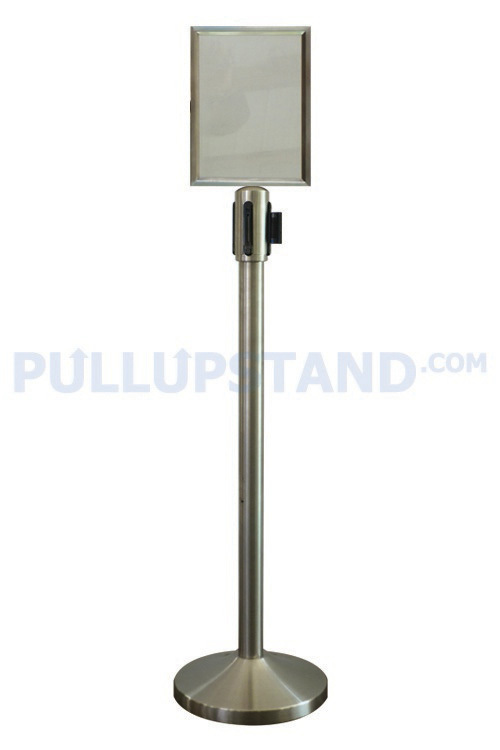 The slot stand (black) is great for holding up posters, and is frequently seen at shopping malls and promotional events. The legs fold up easily for convenient storage. 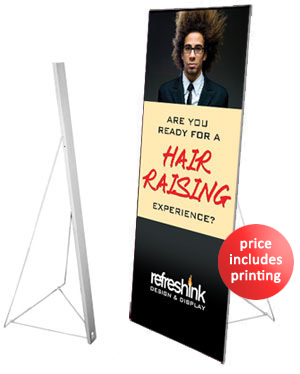 This display stand comes in stylish black, complementing your posters nicely. For poster pricing, please refer to Posters page. The tripod easel is a handy marketing tool, ideal for roadshows and exhibitions. Prop it up with a poster for a commanding display that will entice the passing crowd. It packs nicely into a compact black bag at the end of the day, ready to follow you to your next stop. A very portable display stand. 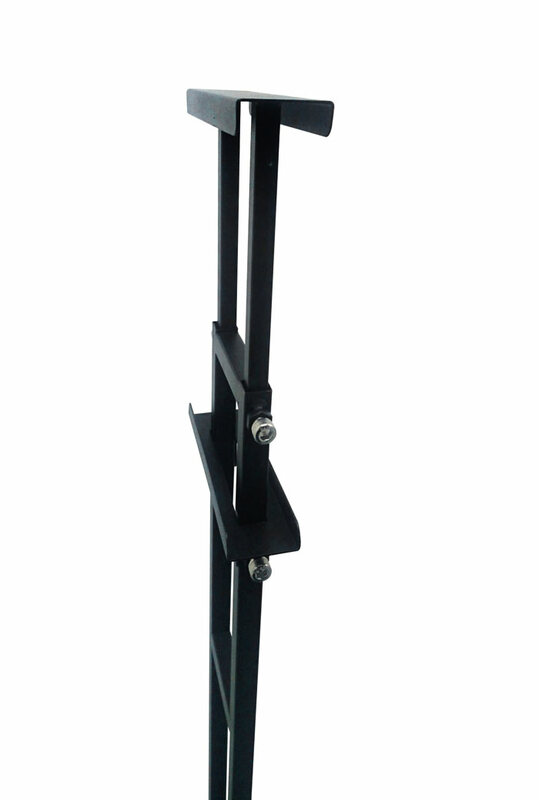 * We can also provide mounted posters for the tripod easel. Full height of 5 metres tall! 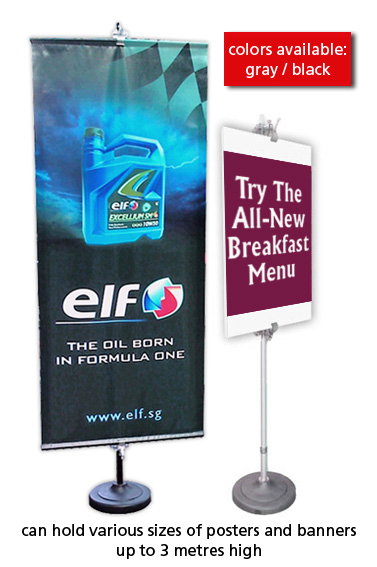 The Giant Flag Pole Banner Stand is great to use in outdoor promotions, at exhibitions and roadshows. 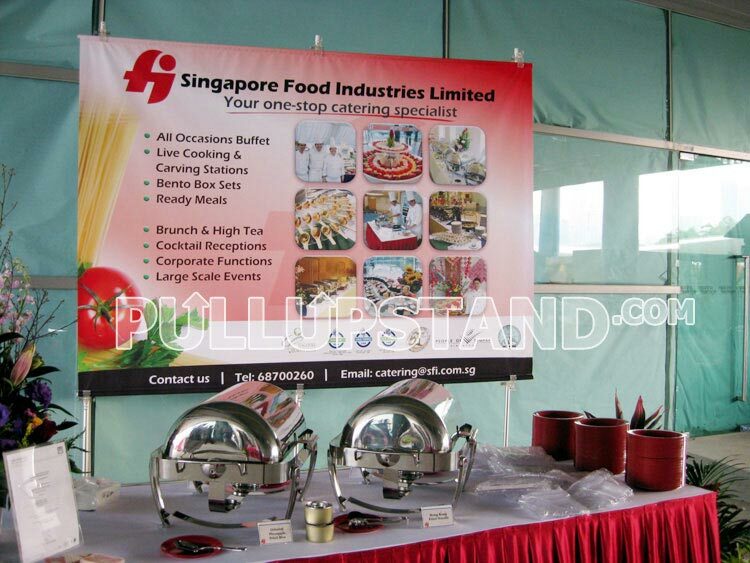 Impactful branding at your events as it towers over everything else and makes a great brand impression! Super portable and can be set up within mere minutes of arriving on the site. You can also fill up the base with water, to make it extra stable in outdoor areas with strong winds. The Flag is printed on fabric in full vivid color, and is detachable from the stand, so you can replace your prints easily or get new flags as and when needed. A great investment to stamp your branding for all to see! 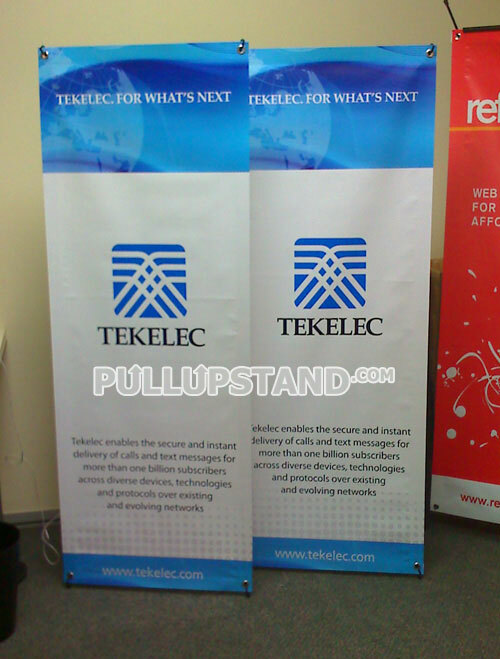 The X banner stand is ideal for the budget-conscious promoter. 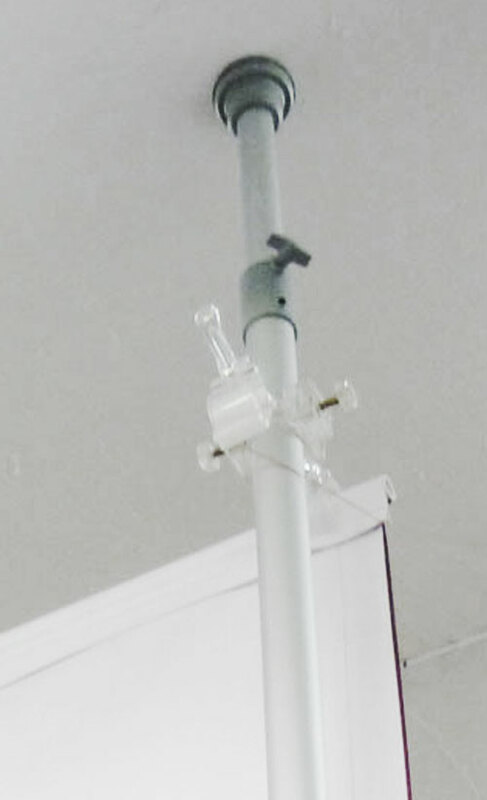 It is easy to set-up and lightweight, with a structure that consists of hollow plastic rods and a central connector. 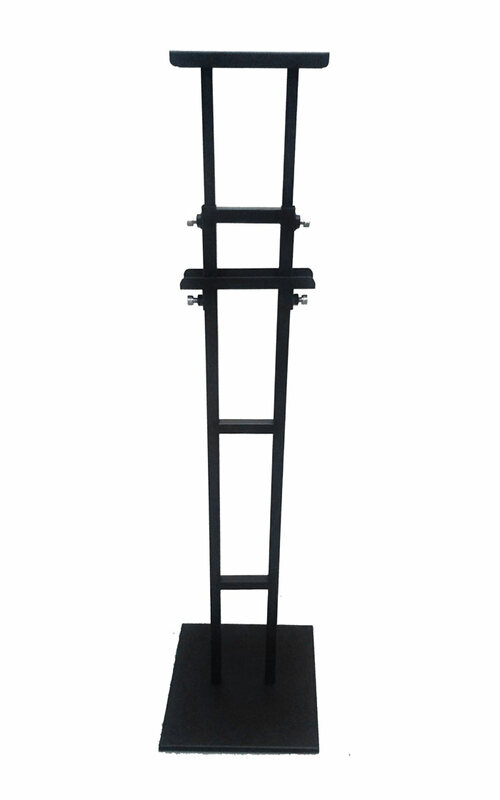 It is great for indoor display, but we recommend that this display stand might not be so suitable for outdoor display due to its light frame. 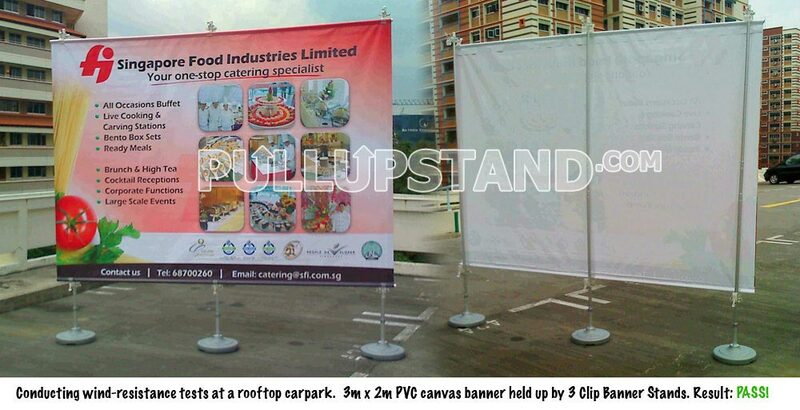 The outdoor banner stand comes with a water base that can be filled up to make it 23kg heavy. 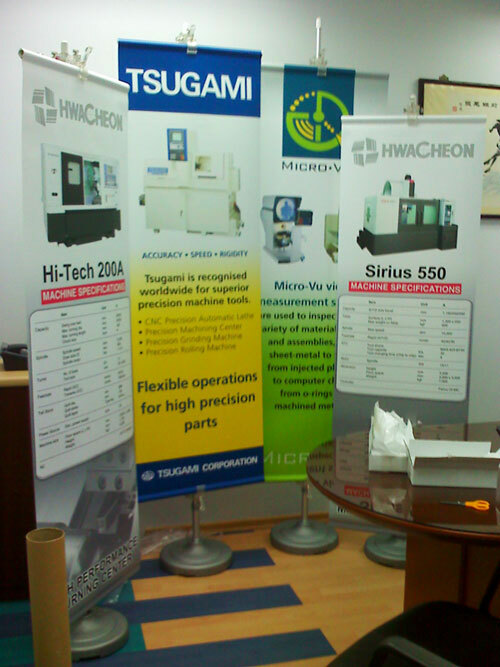 It is also easy to replace the banners with new designs for subsequent events. 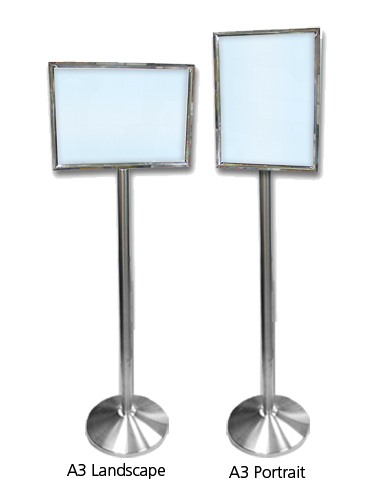 This display stand is available in both singled-sided and double-sided versions. 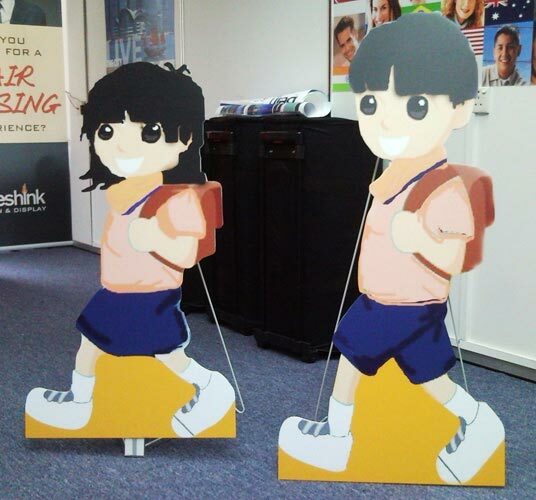 Other sizes of standees, email us for a quote. 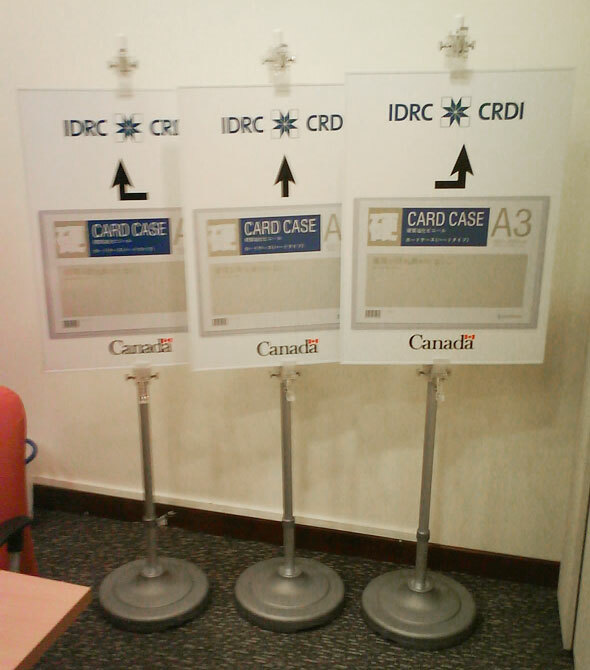 Foamboard standees are great for displaying information and handing out brochure or namecards (when used with stick-on brochure or namecard holders). 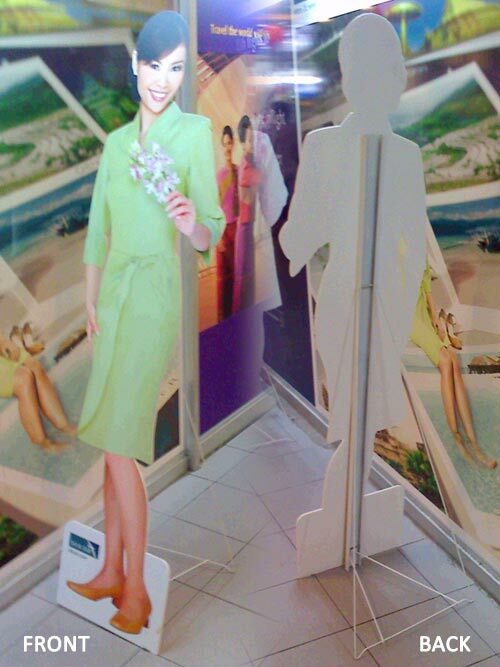 Stop traffic with a great-looking standee. You can even make a standee with a human character outline, eg. in the shape of a stewardess (commonly used by airline companies) or waiter (positioned at entrance of restaurant). The foamboard standee usually makes for an interesting display stand to grab your customers’ attention. * Additional charges apply for diecut irregular shapes. 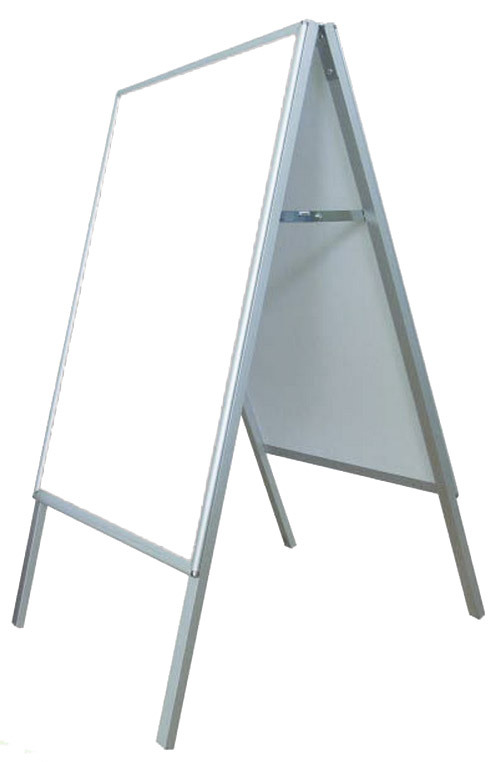 The sign stand is ideal for providing directions or information at high traffic areas such as shopping malls, lobbies, corporate events and office areas. 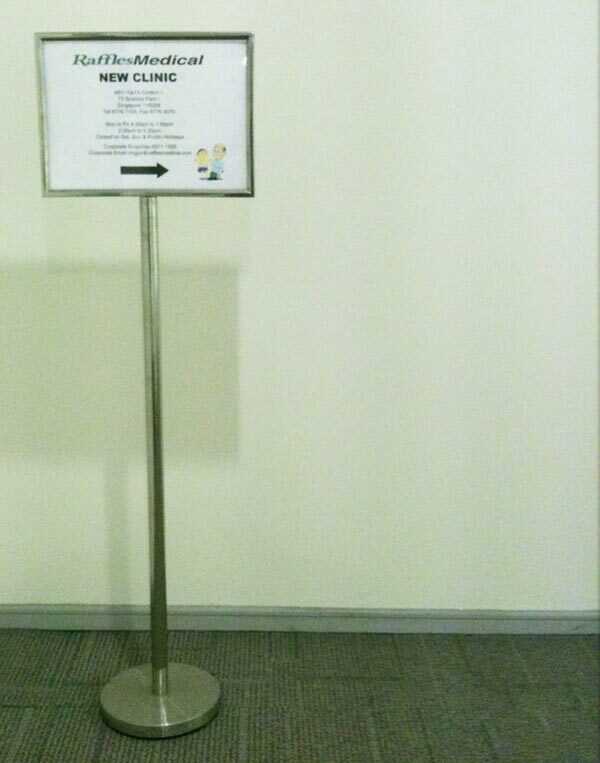 Great display stand for directional usage. 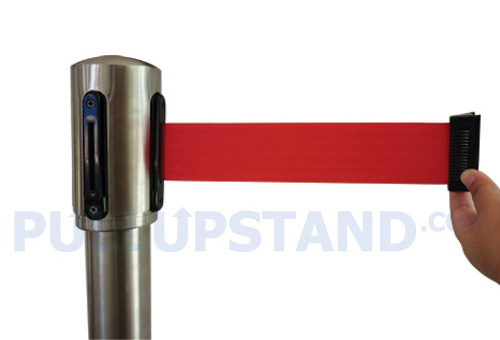 The Q Stand (or queue stand) is the effective display stand for crowd direction and control. 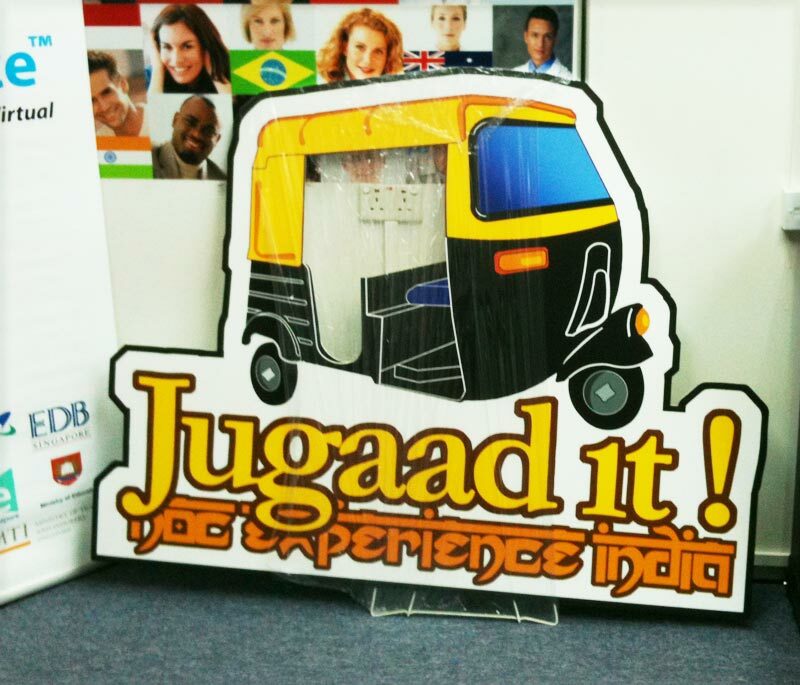 It is popularly seen in banks, restaurants, roadshows and exhibitions. 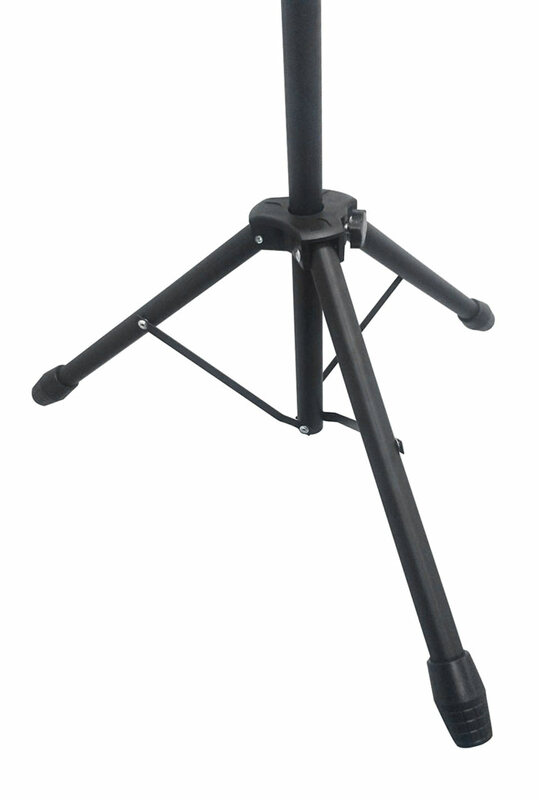 We provide discounted rates for purchase of 10 Q stands or more. 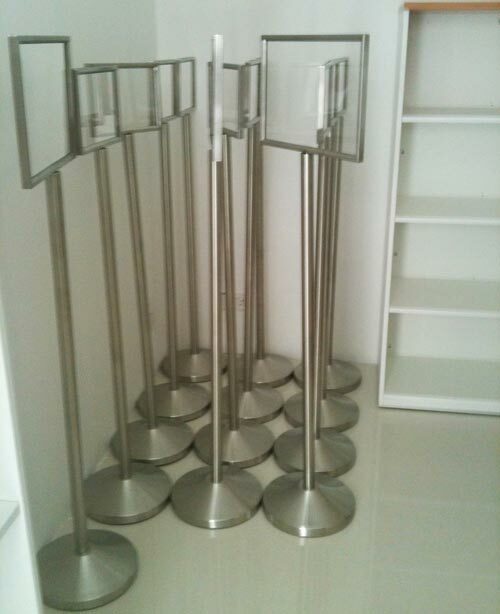 We have ready stock of the Q stands and can deliver within 2-3 working days. 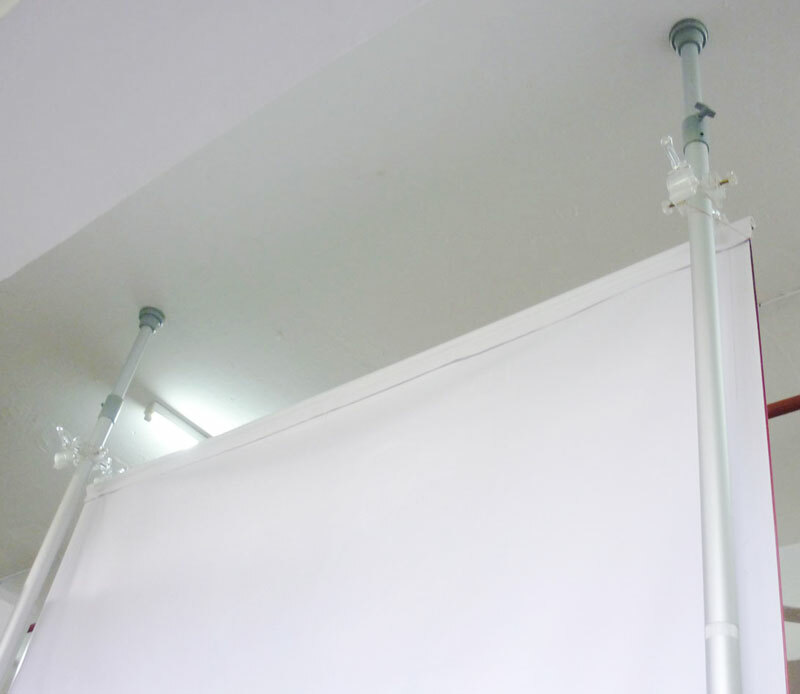 The Extendable Clip Pole is a sleek and non-intrusive way to put up your posters, banners and even backdrops without requiring any drilling or damage done to your interior space.It has a very small footprint, so it takes up very little space. 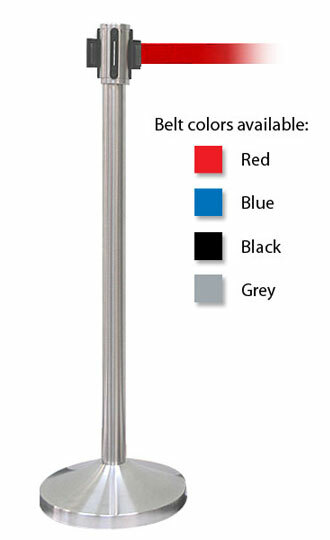 This make the Extendable Clip Pole very popular for entrances to retail shops, to hold promotional posters and lure customers in. It can also be used at temporary spaces like events and exhibitions to set up a bigger backdrop by using multiple sets of poles. At the same time, it can also be used to create temporary partitioned spaces by holding up printed backdrops which block off areas. This is great for interior space planning, and can be used in offices, schools, shops, restaurants and homes. 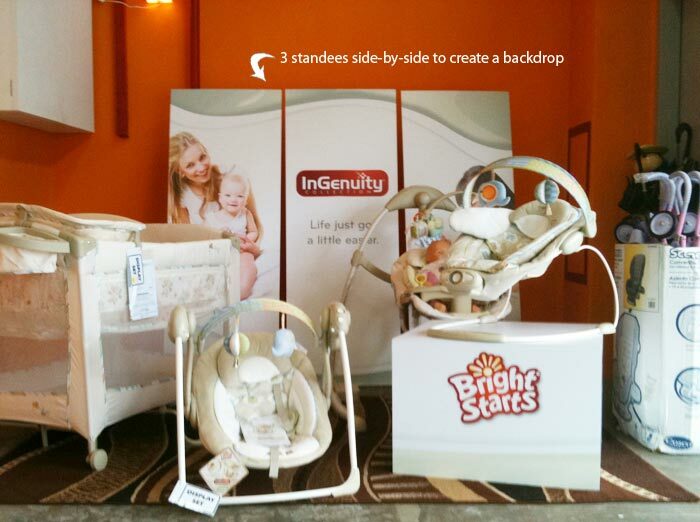 A very versatile display stand. 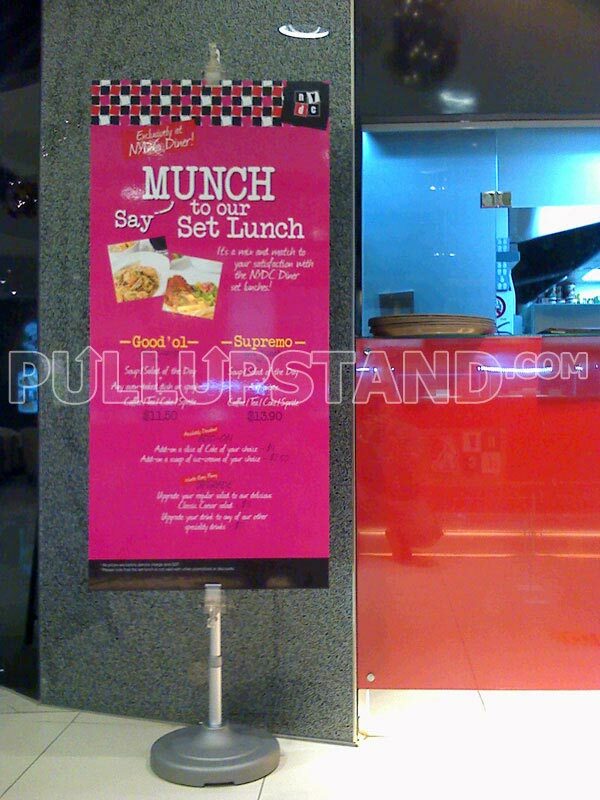 The A-Frame Poster Stand is commonly used at walkways in front of shopping malls and restaurants, to display the latest offers and promotions from retailers. It is stable due to the A-shaped frame with 4 legs set wide apart. It offers double-sided display with posters on front and back. Utilising the snapframe’s easy open-and-shut way of inserting posters, it couldn’t be more of a breeze for you to change your posters on this display stand. It also comes with side brackets and hinges that allows you to quickly keep this stand away at the end of the business day. How Do I Select the Right Type of Display Stand For What I Need? WHAT DISPLAY SIZE DO I WANT? 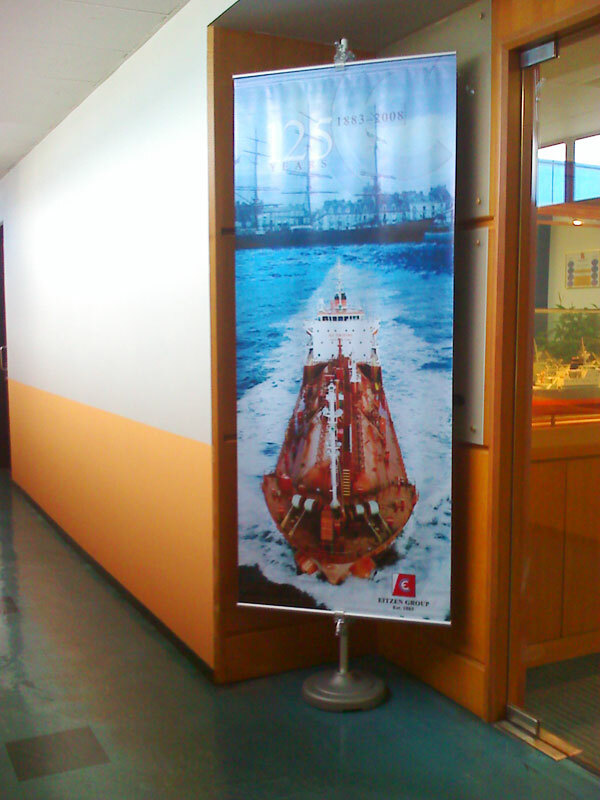 Do you know the size of the banner or poster that you want to display? What is the width and height of your display area? 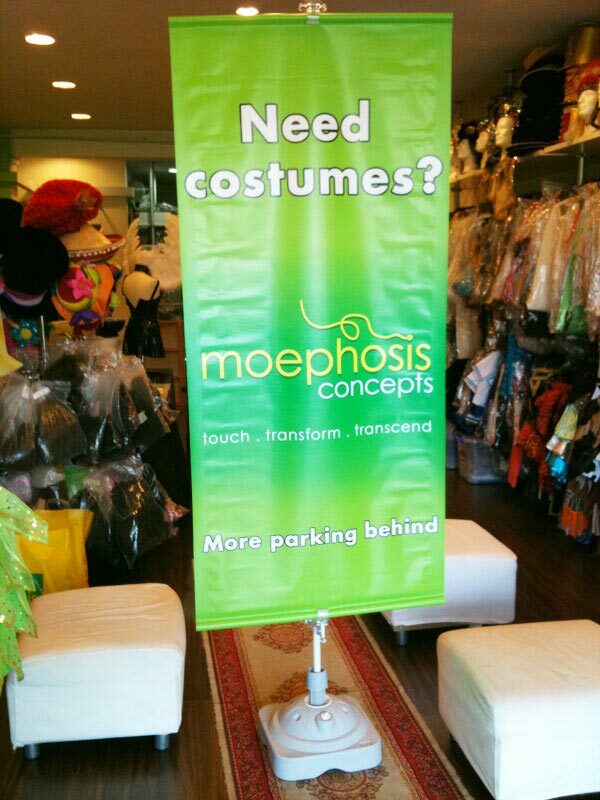 In some cases, you might be limited by the space that you have in your retail shop or event area. Find out how much space you have. Is there a height limitation. WHAT FUNCTION DOES THE DISPLAY STAND SERVE? 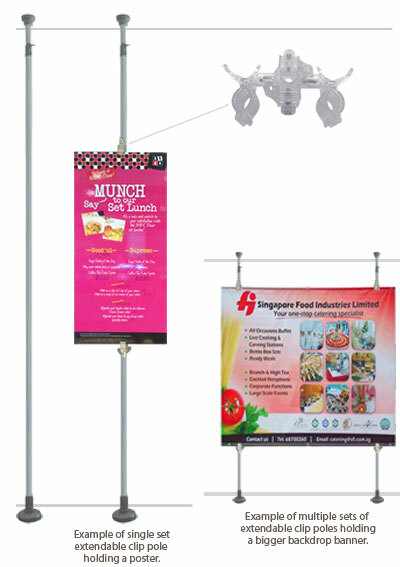 Some display stands like the X Banner, slot stands and clip banner stands are used for marketing purposes. 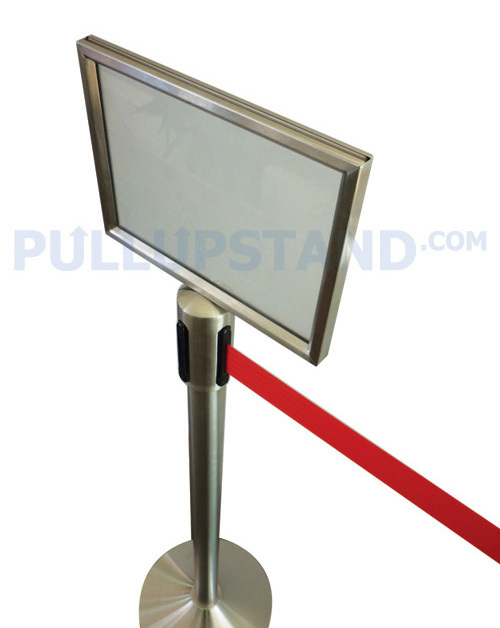 Some display stands like the Q stand is used to direct traffic flow or crowd control. 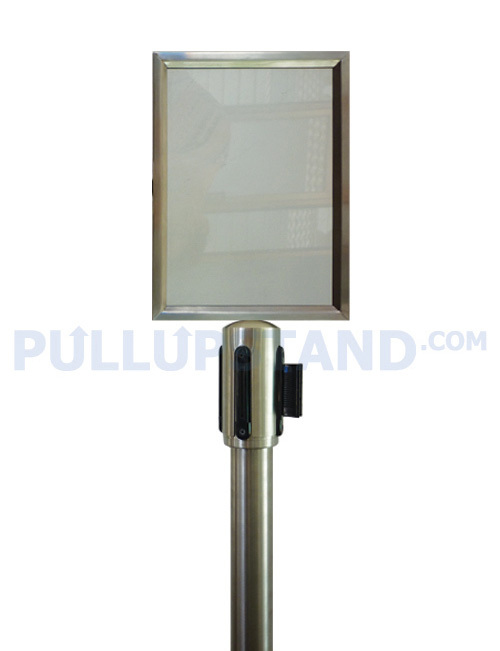 Some display stands like the Sign Stands are used for providing direction or information to viewers. 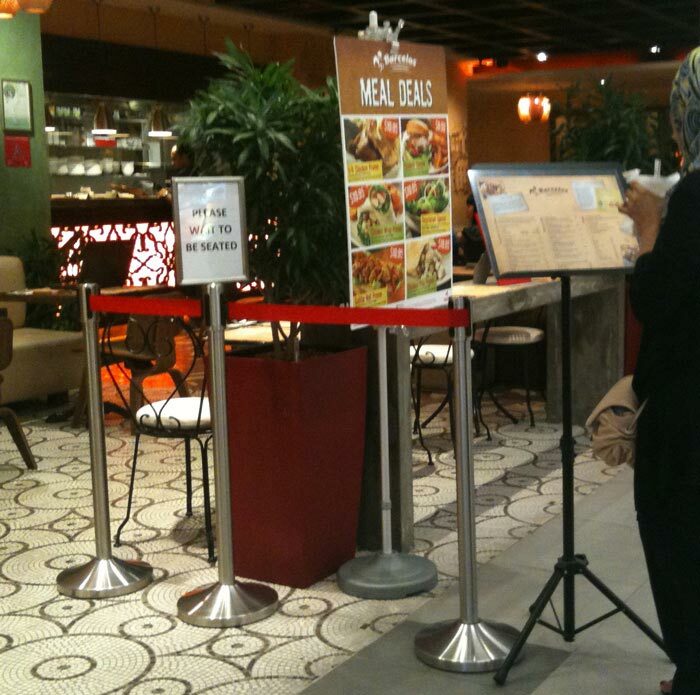 If you know what function the stand will serve, this helps you to narrow down your choice further. WHICH PROPERTIES ARE MOST IMPORTANT TO YOU? 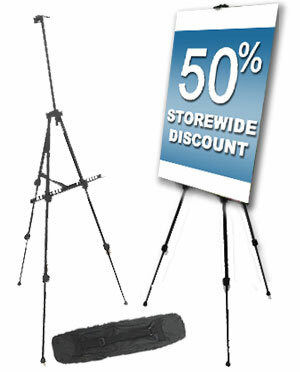 Do you need a display stand that is wind-resistant? 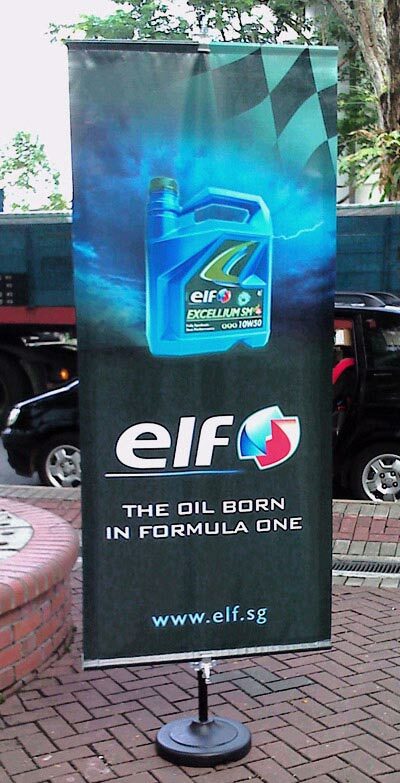 Then a water-based stand might be the suitable banner stand for you. Do you need a display stand that is highly portable? 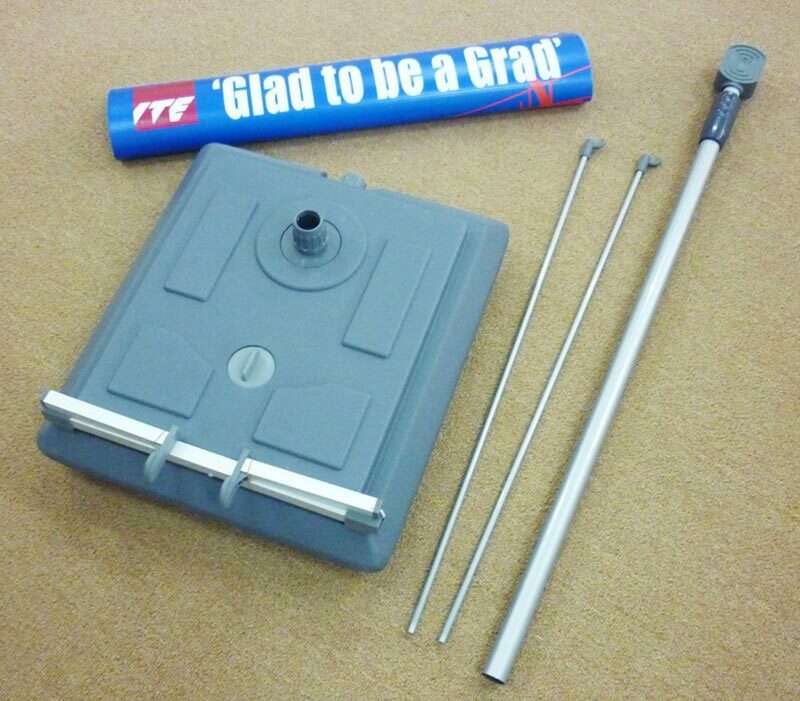 Then the tripod easel, slot stands and x banner stand are your likely choices. Different display stands have different unique properties. Deciding the properties which matter most to you will help you zero in to the stand best suited for your poster, banner or sign. 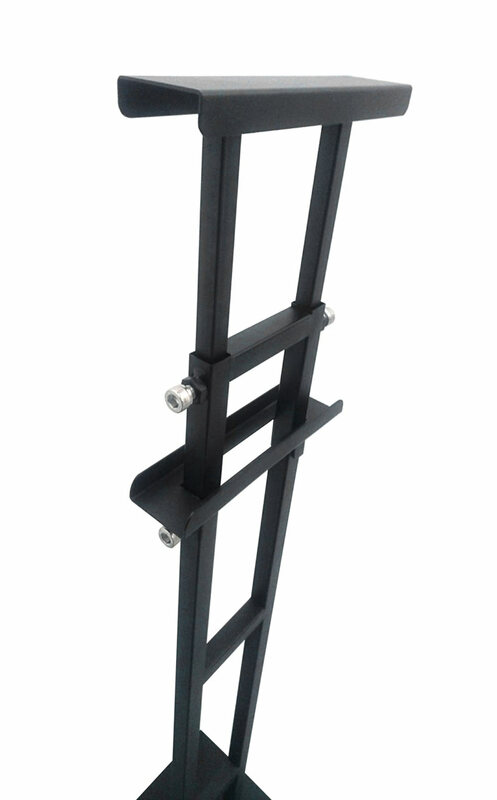 We try our best to provide assistance in choosing your display stands. If you are still unsure which display stand is the right fit for you, do give us a call or email us to set an appointment with us in our office. We will lead you through our showroom, where you can comfortably view the physical samples of the stands and arrive at a better informed decision. Due to the weight of the display stands and the number of options available, it is not convenient for us to bring all the options to your office for viewing. 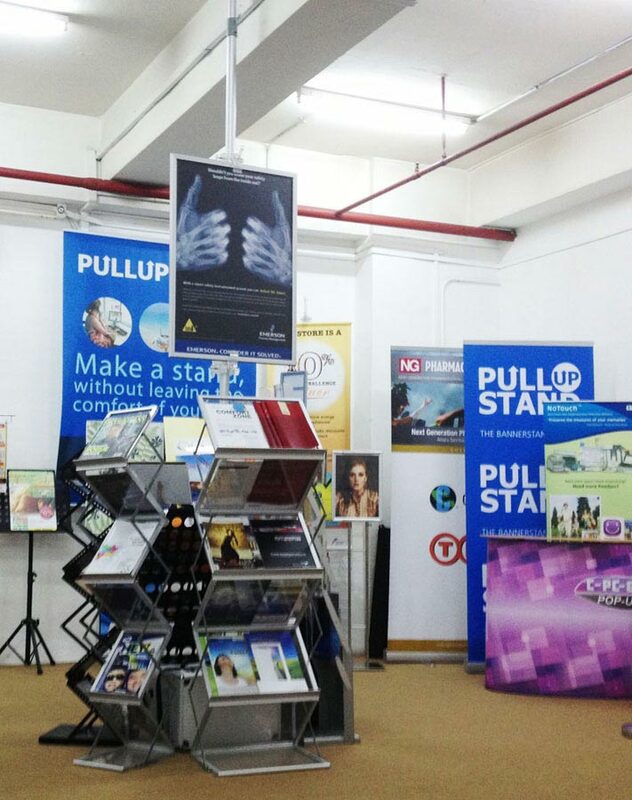 Plus visiting us is the best option to survey all options available, learn how different stands work with different banners or posters and discover the human side to Pullupstand.com. 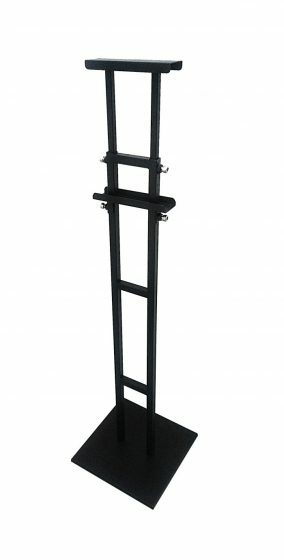 How Do I Purchase a Display Stand? 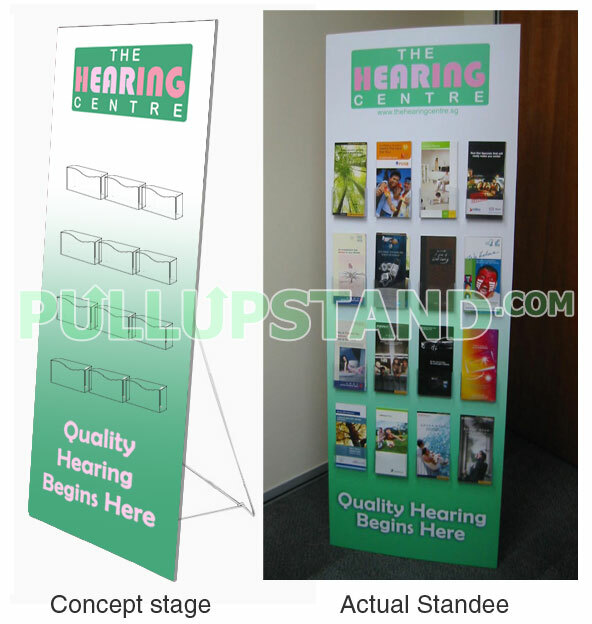 Please select one of the sizes and models of the various Display Stands as seen on the top section of this page. Each model has a product code. For example, the Clip Stand (Water Base) has a product code of CLIPWB. Ensure that it is the correct size you require, and specify the product code to us in your email or phone call, to ensure correct identification of the product. Do let us know the quantity you require. There is no minimum quantity, and you can purchase as few as 1 piece only. If you are purchasing in bulk quantity, do let us know, and we will factor it into our quotation. There is usually a discount for bulk purchases. Be sure to let us know if you have an event coming up, so we can keep your deadline in mind and advise you of the timeline so your display stand will reach you in time. We will check and confirm that your items are in stock, and we will help you schedule the delivery to meet your deadline requirement. DO YOU NEED POSTERS AND BANNERS TOO? 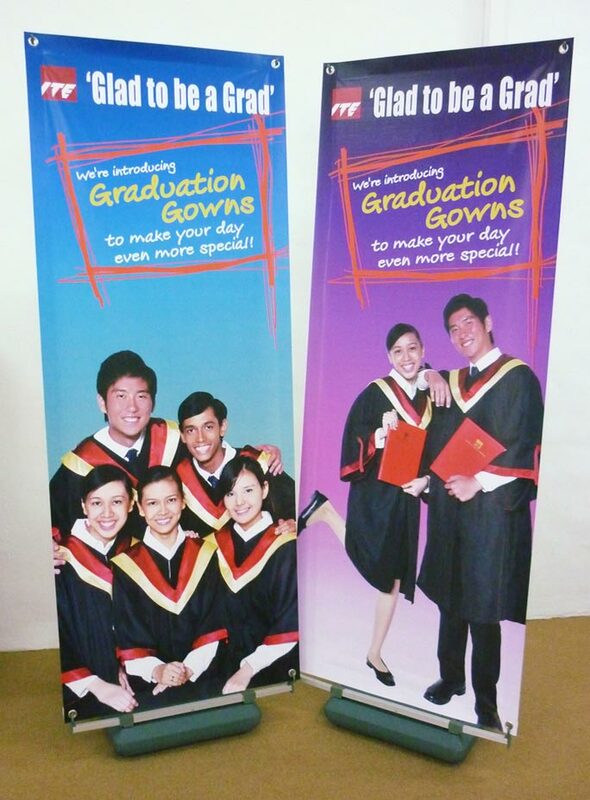 If you have any extra requirements for posters and banners, do let us know. If printing of posters and banners are required, do let us know if you have final artwork ready. We will need you to provide us with high-resolution, print-ready artwork in a suitable graphic software such as Adobe Photoshop, Adobe Illustrator or PDF file in order to print it out clearly and correctly. If you do not have print-ready artwork, do let us know too so we can advise you of the charges for design work done by our team, and of the extra time required to complete the artwork. 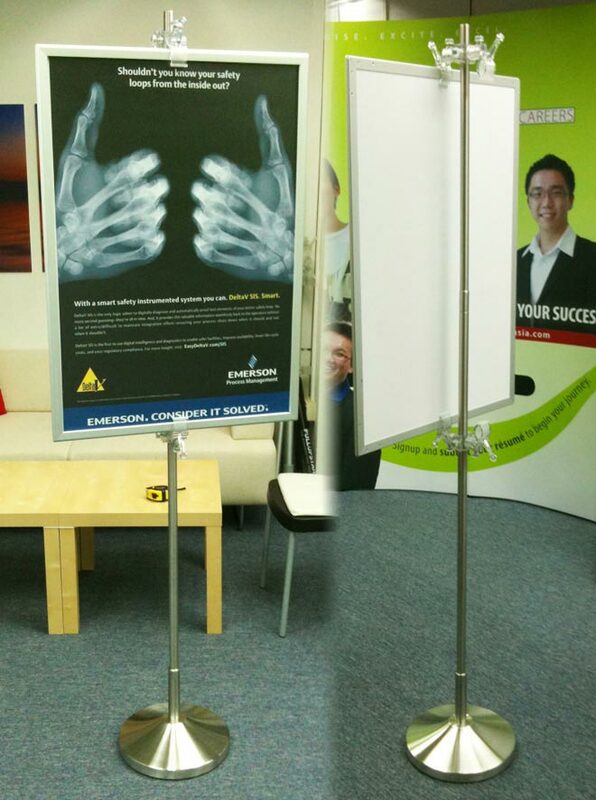 We intend to make the process of purchasing your Display Stand as fuss-free and enjoyable as possible. Feel free to call us or email us for a discussion if required. Can I reuse my Display Stand? The best thing about Display Stands are how reusable they are, for different functions and different times. 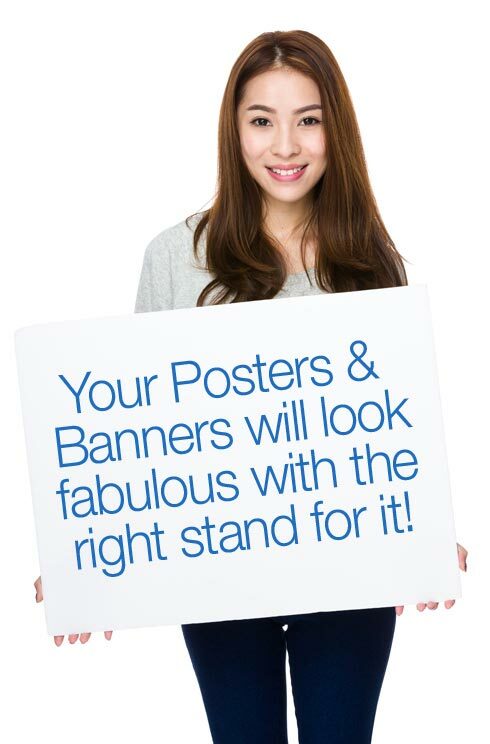 You can easily replace posters and banners and reuse the same stand. 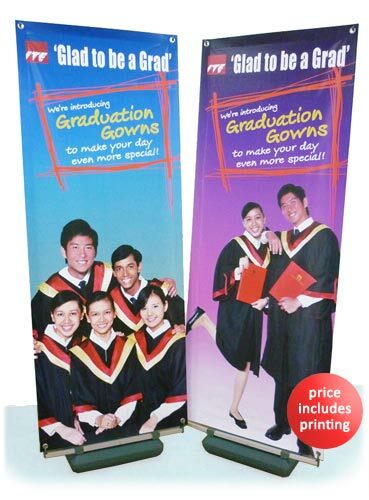 In the case of Clip Banner Stands, you can even combine 2 or 3 Clip Banner Stands to hold a larger PVC Banner. 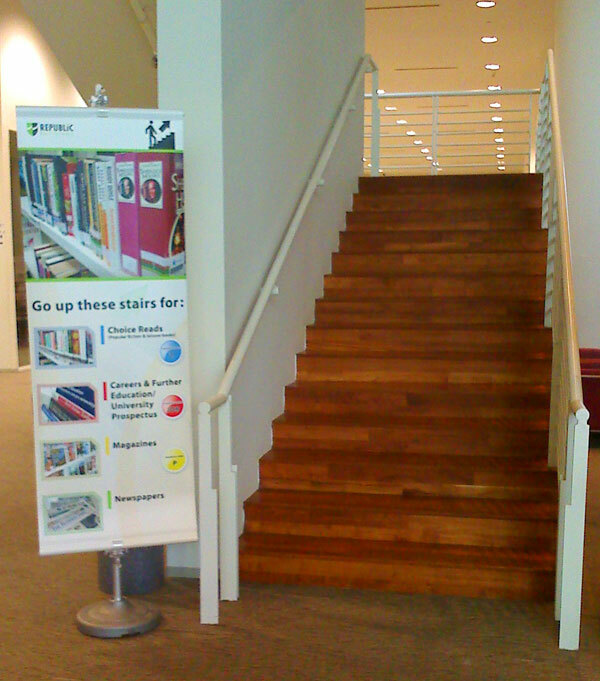 Display Stands are versatile and a good investment for your company, reusable time and again. Does the Price Include Printing? In some cases, where the printed banner size is fixed, our prices include printing, and this is indicated with the sign ‘Price Includes Printing’. 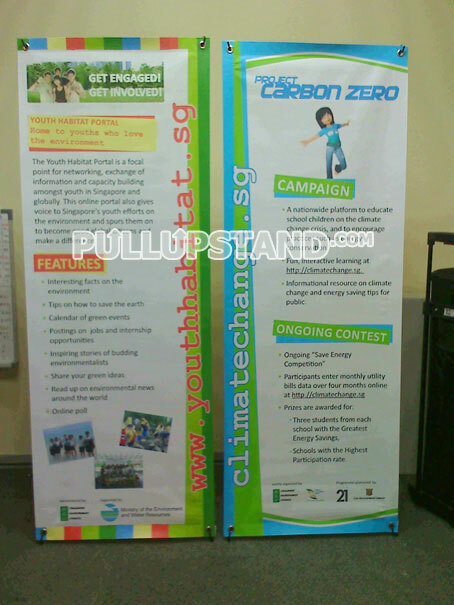 Some examples of these stands are the X banner stand, the Outdoor Water-Based Stand and the Foamboard Standee. 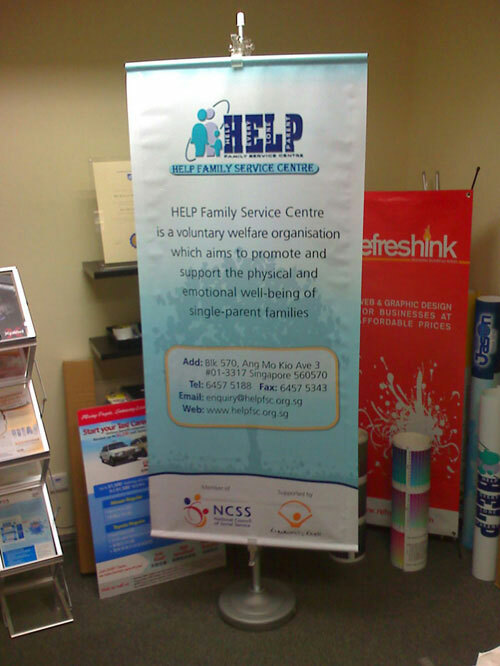 In other cases, where posters and banners can have customised sizes as preferred by the customer, the posters and banners are sold separately. Do check with us on the pricing. Thank you. Do you deliver or must I collect from your office? You can choose to self-collect, but please call ahead to reserve your item and allow sufficient time for us to prepare the order for you. 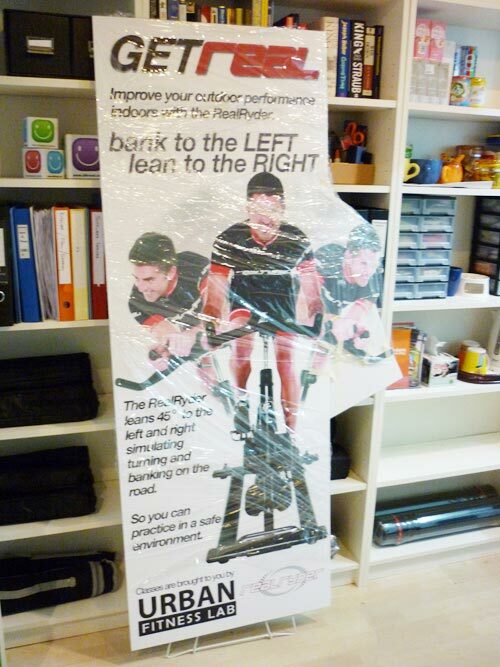 We also provide delivery for your display stands, posters and banners. There is a delivery charge applicable, from $20-$30, depending on location in Singapore. Do check with us.